What can you do at home on a rainy Saturday afternoon for less than $15 that captures the imagination of a a four- and seven-year old and their Dad too? The kids might suggest sitting on the couch and watching all three Harry Potter DVDs. But one recent weekend this Dad had other plans. I had saved up a project, and we had enough free time. It was time to do some Lego microbiology. A few weeks ago while browsing Eric Harshbarger's Lego sculpture website (which includes many amazing creations, including incredible Lego globes, ginormous and clever mosaics, and a full-scale working Lego grandfather clock), I came across his wonderful Miniature LEGO DNA. "Wow, I gotta build one of those!" Where do you get all the special bricks to build something like a Lego DNA? You go to the Ebay of the Lego world, of course: BrickLink. The BrickLink website is a phenomenon to behold. It brings together more than two thousand Lego nuts around the planet who have set up a store to sell you their kits or individual pieces, new or used. Every one of the 44,278,056 items on sale, from the most collectible ancient Lego set to the tiniest 1x1 flat Lego plate is carefully catalogued, counted, and priced. It is all amazingly unofficial, hobbyist-driven, and friendly. And (in a good Lego-nut kind of way) it is all a little bit insane, when you think about it! For the Lego DNA, we would need 40 2x1 red technic bricks, 80 transparent 1x1 cylinders in four different colors, 20 gray technic pins (without friction), a nice round 8x8 plate, and four modified 2x1 plates to stick on a 2x8 plate. While I was shopping, I picked up a few other cool pieces. (And who can resist picking up cool pieces you see even when you don't need them? I had no idea what I'd use "6 x 6 x 10 Stanchions" for, but they ended up coming in very handy in a different project soon enough.) The whole tab? South of $15, postage included. The pieces arrived very quickly and then sat in their shipping box, waiting for some free time. So when the rainy Saturday arrived and the kids were itching for an activity after lunch, I emptied the little box of Lego on our dining table. All the colorful pieces had been packed nicely in tiny ziploc bags, and Piper and Anthony wanted to open them up to play. The nice thing about making Lego DNA with small kids is that it is a very repetitive and simple model. 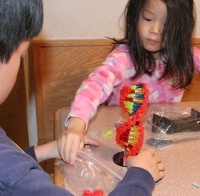 I made a few base pairs together with Piper, who is four, and she had a pretty easy time building a bunch more herself. The main issue was to make sure preschool Piper had a chance to build her share before second-grade Anthony used up all the pieces. But there are certainly a few things that can make you stop to think about DNA along the way, even when you are an impatient second grader. Both kids were pretty happy to see how red "adenine" and yellow "thymine" bases were always supposed to pair up, and that blue "cytosine" and green "guanine" pieces went with each other. "Don't mix them up," Piper said to Anthony several times. "I know, I know, hand me over some more of the yellow ones..."
After they knew that the cylinders were "bases", they wanted to know what all the other Lego pieces stood for. So they learned that the red blocks made "phosphate chains" and the gray pins were "hydrogen bonds." Just words. But kids love to know the names of everything. It was pretty clear to Anthony that the stack of colors were "like a code." So we coded up a TATAAA box to get things started. (I wonder if he will remember that sequence when he grows up!) And then they imagined the spiral going on and on forever in "real" DNA, and how it might unwind and unzip to replicate. The phosphate chains in our Lego model unlinked much too easily: in real DNA, the hydrogen bonds are supposed to be the weak links, and the phosphates are supposed to be strong, but in Lego physics it was the other way around. So there was quite a bit of recombination during construction. But that didn't seem to discourage Anthony, who persisted in squeezing the phosphates of our Lego DNA together until we had all 20 base pairs stacked up in a nice double helix. By the way, if your second grader wants to know what DNA is really for, it can't hurt to sit on the sofa and watch some movies. Here is a good one. There also are some amazing ribosome movies like the last one here that scientists have been making over the last few years. Understanding of the exact chemistry of transcription/translation/etc continues to improve every year, so when the kids grow up, these movies will look like clumsy approximations. But there's no doubt that the real-molecular-structure movies they can already make today are pretty neat. 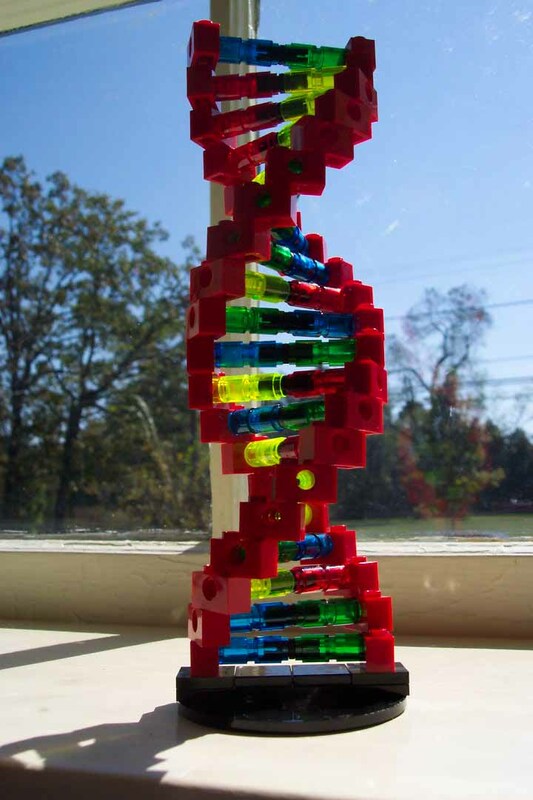 hi i like your DNA model and i m doing a project in biology and i need your guys help on making this dna from legos so if you could take picture of your dna and help me make it that would be great and would really love that. Hey that looks cool. But how did you build it....can you send me some instructions so I can build on too? Once you have the parts, you should be able to build it based on the picture you already have in the article. Just do it one ladder rung at a time. In the "Bricklink" section above I listed the parts I used to build it, with links. Once you have these, you should be able to put together the DNA. If you've tried and you can't get it to work, let me know and I'll post a tip or two. wow! You guys have inspired me to do my science project about DNA. And I know just what I will use for my model. YOU ROCK !!!! hehe, thats cool, I myself usually play around with my legos and though i have tons of pieces and probably all of the ones needed, i dont have them in the right colors, but thats ok! This really helped me for my school project, thanks a lot! Heyy, this has inspired me to do this for my science project! I was wondering does it have a 10.5 turn? And did you show the hydrogen bonding pairs? Like hoe gyanine and cytozine have three bonds and thymine and adenine have two. Is there any way to incoorperate it into the model? Thanks :) this is a massive help. I have never worked with lego. So, Could you please email me instructions to make your model. It would be greatly appreciated. How tall is that one in the picture? I need mine to be at least 18 inches tall so I'm not sure if i can get bigger pieces or what from the store....any advice? Btw the above comment, pleas email me back at desicat2000@yahoo.com ASAP pleaseeee! I'm not seeing any deoxyribose in your backbone.